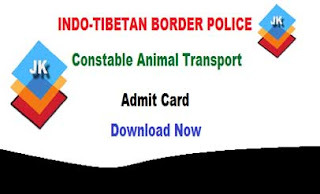 ITBP Constable (Animal Transport) Recruitment 2018-19: Indo-Tibetan Border Police Force has released the admit Card/Hall Ticket for the posts of Constable Animal Transport. All the Candidates, who have filled the online application form for the ITBP Constable Animal Transport 2018, can download the admit card by entering the User ID (Email Address) and password, created by the user at the time of online registration. The admit card & exam date for the Constable Animal Transport available on the official website of ITBP. ITBP has going to conduct the Physical Efficiency Test (PET) and Physical Standard Test (PST) for the 85 posts of Constable Animal Transport. Candidates who have successfully filled their online application form, can download the admit card through the link is given below. In this article, we have tried to provide all the information regarding the ITBP Constable Animal Admit Card 2019. Candidates are advised to check this page regularly to get updates on ITBP Constable Animal Transport Exam 2019.